Forget Menemsha. Whatever you read, whatever you are told, this is not the place to fish. Like Caye Caulker, Bal Harbor even Rio, it is an awkward walk to a jetty, overrun with heavy boat traffic, strong currents, and plenty to snag on with nothing to show for it. 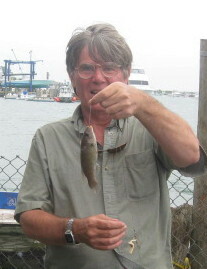 If you absolutely have to fish there, remember it is at the counter-clockwise end of Menemsha Pond. The best bet is the dock in Edgartown right next to the ferry to Chappaquidick.. Not only did I catch fish, but the couple next to me were running a clinic on how to fish squid. My lesson: just because it says “pond” doesn’t mean it is fresh water. So you can save yourself $35+ for freshwater license. Salt water is free!